We enjoy ethnic food and love cooking it at home. 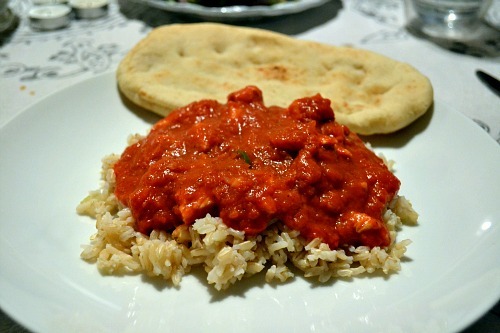 I first made this Chicken Tikka Masala from Cook’s Illustrated a couple of years ago and was so impressed that I was able to make such a delicious Indian dish at home. 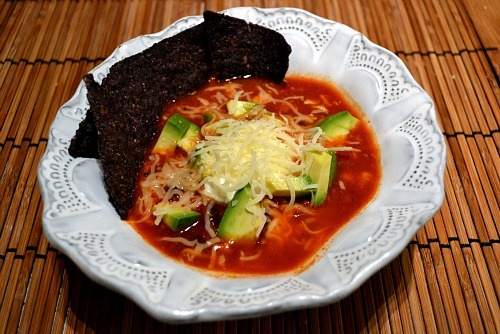 Although the recipe does have quite a few ingredients and multiple steps, it is fairly easy. Don’t be intimidated if you’ve never tried anything like this at home! 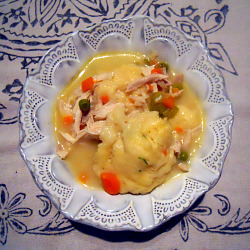 The sauce and chicken are cooked separately and stirred together in the end. 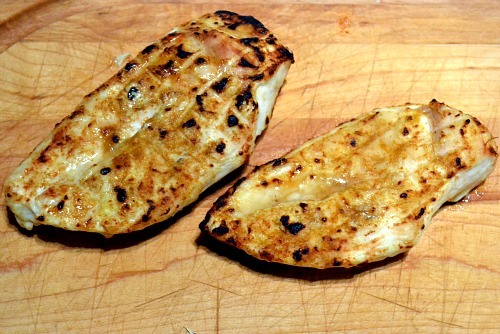 The chicken is dipped in yogurt and broiled which yields tender meat with nice charred spots. While the chicken cooks, the masala sauce simmers. The sauce has a nice, slow burning heat thanks to a serrano chili. If spice isn’t your thing, substitute a milder pepper or omit it all together. The only substitution that I made to the original recipe was to sub the heavy cream in the sauce for plain yogurt. I thought that the plain yogurt would work well in this dish to add creaminess based on my success with this Curry and Yogurt Braised Chicken that we love. It turned out just as tasty as I hoped and the plain nonfat yogurt provided guilt-free creaminess. I served the tikka masala over brown rice with naan on the side. Naan is a must for dipping into the delicious sauce. I usually make homemade naan but was pressed for time so I used Trader Joe’s naan. It was passable but Brandon and I both agreed that the homemade is much better. One final note, this dish reheats well. It’s one of those things that has even more flavor the second time around. 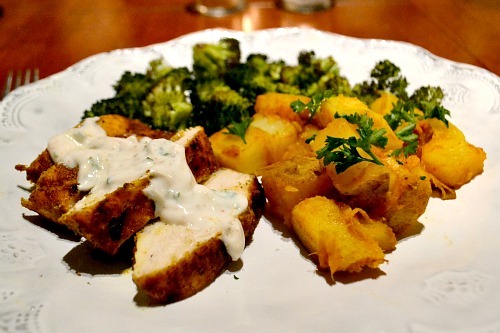 Whether you love Indian food or have never made it at home, this is an awesome recipe to try! In a small bowl, stir together cumin, coriander, cayenne and salt. Sprinkle both sides of chicken with spice mixture and press gently to adhere. 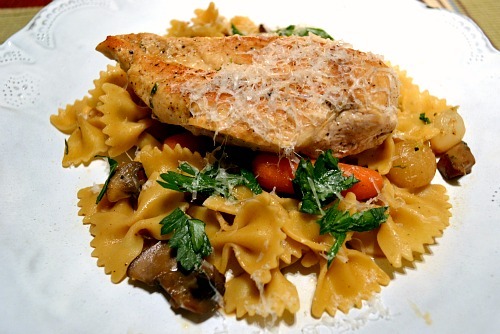 Cover chicken and refrigerate for 30 minutes to one hour. While chicken is in fridge, in large bowl, whisk together yogurt, oil, garlic and ginger. In a large Dutch oven, heat oil over medium heat. Add onion and cook, stirring frequently, until lightly browned, about 8 to 10 minutes. Add garlic, ginger, chile, tomato paste and garam masala and continue to cook, stirring frequently, about 3 minutes. Add crushed tomatoes, sugar and salt and bring to boil. Reduce heat to medium-low, cover and simmer for 15 minutes, stirring occasionally. Stir in cream or yogurt and return to simmer. Remove pan from heat and cover to keep warm. While sauce is simmering, Line a baking sheet with foil and place a wire rack over it. Spray rack with cooking spray. Adjust the oven rack to upper-middle position (about 6 inches from heat) and pre-heat broiler. Dip chicken into the yogurt mixture (you’re looking for a thick coating of yogurt) then arrange chicken on the wire rack. Discard excess yogurt mixture. Broil chicken until thickest parts register 160 degrees on instant-read thermometer and exterior is lightly charred in spots, 10 to 18 minutes, flipping chicken halfway through cooking. Let chicken rest for 5 minutes and then cut into 1-inch chunks. Stir into warm sauce (do not simmer chicken in sauce). Stir in cilantro, season with salt to taste and serve over rice with naan. We have a white chicken enchilada recipe that we love and Brandon requests all the time but I kept reading great reviews of a recipe from America’s Test Kitchen. When I saw Josie blog about them and deemed them, “the best enchiladas ever,” I knew that I had to try this recipe. I think that Josie and I have really similar tastes. I don’t think she’s ever posted anything on her blog that I wouldn’t make. If you haven’t checked out her blog, Pink Parsley, you are totally missing out! These enchiladas lived up to the hype. They were fabulous and I seriously couldn’t stop talking about how much I loved them. I think every time I took a bite I “mmm’d” and said “this is sooo good.” I couldnt’ wait to have the leftovers for dinner the next night. My favorite thing about them is that the enchilada sauce is homemade and not from a can. I am really trying to eliminate canned soups and sauces from our meals and this sauce was so much better than anything you can buy in a can and was relatively easy to make. These enchiladas would be perfect for everything from a family dinner to entertaining to taking a meal to friends. I served them with Mexican Quinoa. A wonderful meal! Preheat oven to 425 degrees. Spray a 9×13 baking dish with cooking spray and set aside. Heat oil in a large saucepan over medium heat and add onion, jalapeno, 1/2 teaspoon salt. Cook, stirring often, until onions and peppers have softened, 8-10 minutes. Stir in garlic, chili powder, cumin and sugar. Cook until fragrant, about 30-60 seconds. Stir in tomato sauce, water and chopped tomato. 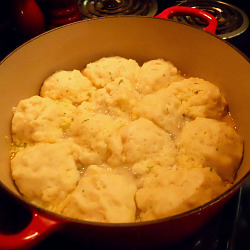 Bring to a simmer and cook until slightly thickened, 5 minutes. 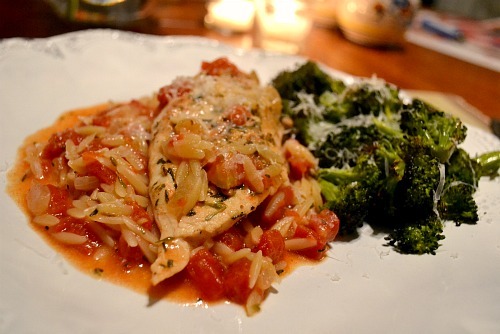 Nestle chicken into the sauce and reduce heat to low. 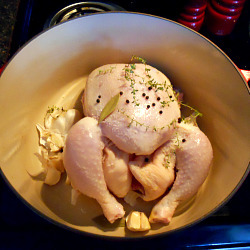 Cover and cook until chicken is cooked through (internal temperature should read 160 degrees), about 12-20 minutes. Transfer the chicken to a plate and set aside to cool. Strain the sauce through a strainer into a medium bowl. Press the onion mixture to extract as much liquid as possible. Transfer the onions to a large bowl and set aside. Season sauce with additional salt and pepper to taste. Shred the chicken into bite-sized pieces and add to the onion mixture. Add 1/4 cup of the enchilada sauce, 1 cup cheese, and cilantro. Toss to combine. 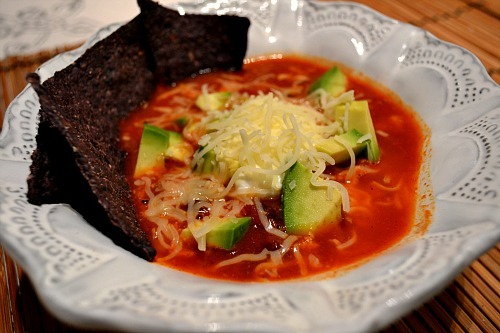 Wrap tortillas in a paper towel and microwave on high until warm and pliable, 40-60 seconds. Working one tortilla at a time, spoon 1/3 cup of the chicken mixture evenly down the center of each. Tightly roll each tortilla and lay seam-side down in prepared baking dish. Lightly spray the tops of the enchiladas with cooking spray. Place in the oven, uncovered, for about 7 minutes, or until the tortillas start to brown slightly. 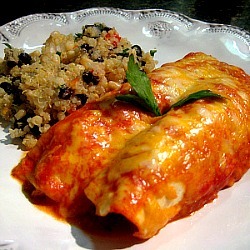 Remove enchiladas from oven and reduce heat to 400 degrees. Pour sauce evenly on top of enchiladas and top with the remaining cheese. Cover dish with foil, and bake an additional 20 minutes, or until heated through. Remove foil and bake another 5 minutes, until cheese browns. Remove from oven and let stand 10 minutes before serving.